I have been here and to say it is not pleasant is an understatement. I know many who simply just stopped answering their phones (at all hours of the night and day). The worst I think is when these collectors try to collect a debt from a dead person----My friend's Mom died and it took all our ingenuity to get them to realize that they would have to go to the cemetery of they wanted to collect the money! She had not left anything at all!! So now read below --oh how I wish this book had been around when I or my friend's needed it!! 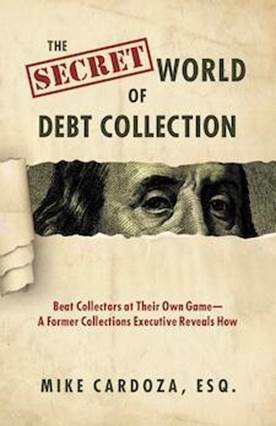 Mike Cardoza, an attorney based in San Francisco, has just published The Secret World of Debt Collection, a unique “manual” for those who would like protection from debt collectors. 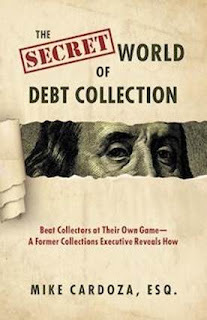 His easy-to-read and comprehensive book exposes an eye-opening array of illegal conduct in the collection industry and tells the reader what to do about it based on years of inside experience working for debt collection agencies. Keep Everything: Debt Collectors, Debt Buyers, and Creditors run into real legal problems when they say one thing, but do another. Or promise to do something, but then fail to do it. Or just plain violate the law. Action: Save Your Mail and Your Collection Voicemails. Save everything you suspect to be a collection notice for at least a year. Save voicemails from Debt Collectors that are aggressive, rude, or which fail to clearly state that they are a communication from a debt collector. If you’re getting repeated calls to your cell phone from collectors and you didn’t give express permission for them to dial your cell phone, answer those calls so that you can verify who is placing them and so that they will be recorded on your cell phone bill. If you did give consent, then write or call to revoke it - and then watch for subsequent calls. Keep a log of what collectors called from where and when and what they said. Respond to Lawsuits: If you are served with legal papers, respond within the proper time frame. Verify the rules in your state through the state Attorney General's office. Verify which forms you need to fill out in response. Consider hiring an experienced debt defense attorney to advise or represent you. If you do nothing, they win. If you fight, you may win or get a great settlement. Action: Get an Attorney & Go to Trial – The burden is on the debt collector to prove they own the debt and that you are the correct person to pay it. The lender does not get to decide how much you owe. Only the court can do that, and only after both sides of the case have been heard. Your attorney will know what cards to play and when and may even find legal violations that entitle YOU to compensation. Protect your money: You and the people you love need you to have that money, now and in the future. Don’t leave the back door open. Put money that’s exempt from garnishment or involuntary seizure pursuant to a legal judgment in your state into a stand-alone bank account and don’t ever mix it with any other money from anywhere else. Close your accounts with the large national banks. Action: Close every bank account that you ever listed on any application for credit that is currently in default. You can win if you understand the difference between a moral obligation and a legal one. The bottom line, Cardoza believes from working both sides of the courtroom, is that the laws - with the help of a good attorney - favor the consumer. 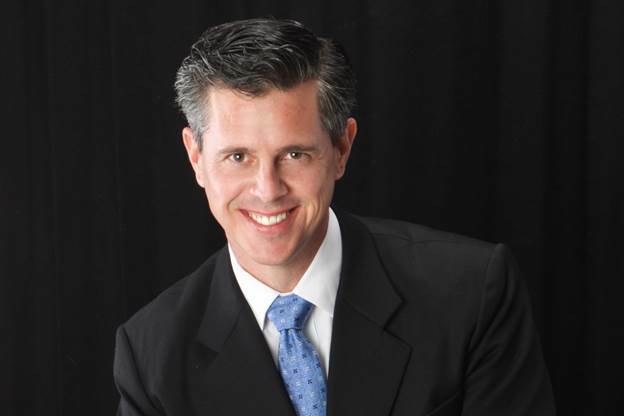 Mike Cardoza is a former senior executive of a debt-buying company, a debt collection agency, and a major regional high-volume debt collection law firm. A graduate of the Georgetown University Law Center, and UCLA with a degree in Business Economics, he is a veteran of the war in Iraq and continues to serve his country as an officer in the U.S. Marine Corps Reserve. He founded The Cardoza Law Corporation in order to share the truth about consumer credit and finance with the people who need it most. He lives and works in the San Francisco Bay Area. Interviews include Marketwatch, Huffington Post, Detroit News/Chicago Tribune News Wire, Business Insanity Talk Radio, Biz Talk Radio, KGO’s Consumer Radio, and Radio America’s Home and Family Finance. I posted this because I felt it might help someone. I was not compensated nor did I read the book. All opinions expressed are my own honest opinions. For more information please check my Disclosure Statement. Our giveaways are in no way sponsored or promoted by Facebook. I wish I had this book when I was in deep debt a few years ago and the debt collector was harassing me. I will look for this book. My husband is a money guy! He will flip over this book! Now this is a book that I know a lot of people have been waiting for. A few years ago I would have needed this but who knows, maybe I can still get a copy. You never know how your finances may become. I had a friend who worked in debt collection. To label it as a slimy business/industry is being nice. This sounds like a really interesting read. I have heard horror stories of debt collectors harassing people. Been there! It was a very unpleasant time for me. This sounds like a very helpful guide for people who are now in my former shoes. That sounds like a really useful book. I know it can be hard maneuvering through those situations, so it's great to have some guidance. This is such an important topic, especially in our economic times! I will pass it (and your info) along! Sounds like a helpful book. I hope I don't get in a position that I need it. This sounds like a very interesting book! I always love to hear the inside scoop on things--I had no idea there was so much involved in debt collection--or ways to avoid it! Great resource! It is true, some debt collectors can go too far. We must also know our rights and how to protect ourselves and our money. This looks like a really useful book. I hope I never have to use it though. This sounds absolutely fascinating! I really want to read it!